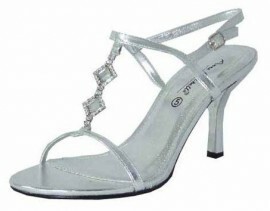 Strapy silver evening sandals with encrusted diamante detailing on the foot. Padded insole & 3" heel for that extra height and streamlined legs. Silver party shoes are a must have for every woman's warbrobe.